The US dollar is broadly lower as corrective forces that were becoming evident in the second half of last week have carried over into today's activity. The greenback is lower against all the major and most emerging market currencies. Global equities have begun the new week on firm footing, and peripheral European bond markets continue to build on the recovery in the second half of last week, while core bond yields are up 1-2 bp. 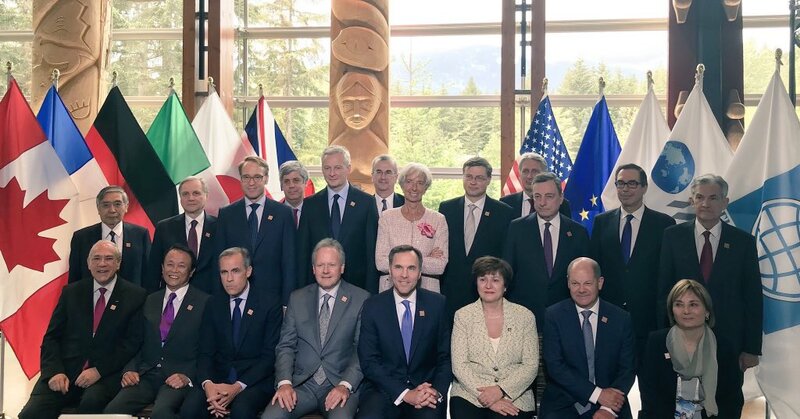 Despite the brave face put on it by Treasury Secretary Mnuchin, the US was isolated at the G7 finance ministers and central bankers. The US provocations were broadly criticized. This sets the stage for an uncomfortable G7summit this coming weekend. 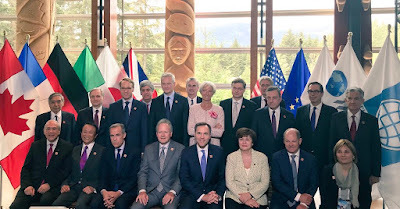 What seems to annoy Europe and Canada more than the tariffs themselves is the justification. National security. The weekend bilateral talks between the US and China also did not result in fresh progress. The US appeared to signal that talks would put the tariffs on hold and then a few days before Commerce Secretary Ross went to Beijing that the tariffs on $50 bln of Chinese goods in retaliation for intellectual property rights violation were seen as an insult rather an inducement to negotiate. The Australian dollar is the strongest of the majors, rising around 1% against the US dollar. The gains were ostensibly spurred by a series of stronger than expected data, including Q1 inventories (0.7% vs. expectations for a flat report), operating profits (5.9% vs 3.0% forecast) and uptick in job advertisements, and a 0.4% gain in retail sales after no gain in March and a 0.3% average gain in Q1 18 and 0.2% average monthly gain last year. The Australian dollar is testing a trend line from the late January high of the year (~$0.8135) and April 19 highs (~$0.7815) and found near $0.7440 today. Above there, we peg resistance in the $0.7660-$0.7690 band. The euro is well bid today and is posting gains against the greenback for the third session in the past four. The news stream is light. Spain's employment data (unemployment -83.7k in May after an 86.7k fall in April), build on the momentum seen last week with a 0.7% expansion in Q1. Spanish unemployment has fallen from about 27% five years ago to around 17% now. EMU countries will sell around 13 bln euros of bonds this week, and that does not include Spain, which has not yet announced the size of its auctions. With no significant maturities, foreign demand may also be demand for the euro. Peripheral bonds in Europe have continued to rally. The 16 bp decline in Itay's 10-year yield puts it down 18 bp over the past five sessions. Spain's 10-year yield is off 20 bp over the same period, and Portugal's yield is off 33 bp. Tomorrow, League leader and new Interior Minister Salvini will be attending his first EU ministerial meeting, and this will be closely watched by investors. Di Maio, the head of the Five Star Movement, and new Minister of labor and industry will be pushing for the guaranteed income scheme that it promised. It is less of a universal basic income than an unemployment insurance scheme, with assistance to for those that cannot get into the labor market. Another important issue for investors is the fallout from the downgrade of Deutsche Bank at the end of last week and the meeting today between Merkel and Draghi to ostensibly discuss the related issues. The bank shares have stabilized today. The DAX is up about 0.4% near midday in Frankfurt, and the financials are up about 0.6%. The Dow Jones Stoxx 600 is up about 0.6%, and financials are up about 0.8%. The euro poked through last week's high (~$1.1730). We peg initial resistance now in the $1.1750-$1.1760 area, which houses the 20-day moving average, congestion form late-May, and the 50% retracement of the euro's last leg lower that began on May 14. Above there, risk extended to a little above $1.18. Neither trade tensions nor the approaching US-NKorea summit prevented Asia-Pacific equities from rallying. The MSCI Asia Pacific Index rose 1.35%, the most in almost three months. Indeed, it gapped higher, and the gap (172.59-172.71) was unfilled, and a three-island is in its wake. We expect additional near-term gains. The dollar advanced 0.65% against the yen before the weekend and is struggling to build on those gains today. There is a large option ($1.7 bln) struck at JPY110 that expire today. The JPY109.75 area corresponds to a 50% retracement of the dollar's leg down that began near JPY111.40 on May 21. A move above JPY110.20 would lift the technical tone. Turkey reported firm inflation figures, and this is seen boosting the chance of a rate hike late this week. The May CPI rose to 12.15% from 10.85%, as economists had anticipated. Producer prices also accelerated. The central bank meets on June 7, and the market leans toward a 50 bp hike in the overnight lending rate and perhaps a smaller increase in the overnight borrowing rate. The lira is about 0.4% stronger than the dollar (@~TRY4.6315). The US session features April factory orders and the final durable goods orders. Investors appear to already have taken on board that the US economy is accelerating in Q2. US shares are trading higher in Europe and electronically. A move above 2750 in the would encourage participants to look for 2800. Meanwhile, note that eight states hold primaries tomorrow. The focus is on California, where the Democrat hopes to capture the House of Representative in November rests. Primary rules that have the top two candidates face-off in November is a challenge for Democrats due to the sheer number of candidates that are running under its banner. Note that in recent weeks, the odds of the Democrats securing a majority in the Senate appears to have fallen.